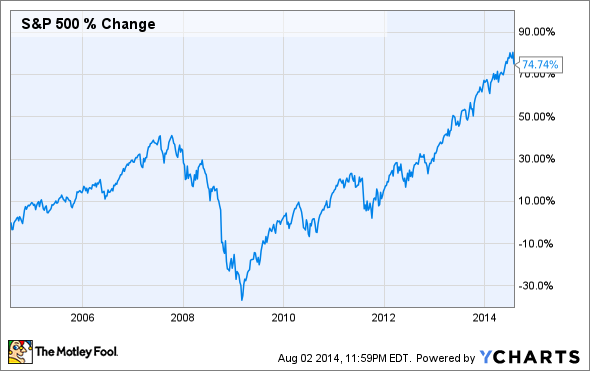 According to Warren Buffett, long-term investors should be happy when the stock market plunges. So smile when you read a headline that says "Investors lose as market falls." Edit it in your mind to "Disinvestors lose as market falls -- but investors gain." Though writers often forget this truism, there is a buyer for every seller and what hurts one necessarily helps the other. When the stock market is in a tailspin, it's natural for investors to feel a sense of panic. If you check your investment account balance daily -- or even more frequently -- it can seem like your hard-earned money is inexorably disappearing. According to Warren Buffett, if you're feeling stressed about falling stock prices, it's because you are thinking about investing the wrong way. In fact, true "investors" should prefer to see stock prices falling. The key to Warren Buffett's insight is that by definition, long-term investors are not looking to sell for a long time. If you really do have a long-term horizon, all that matters is what the value of your investment will be far in the future: when you plan to sell. As an individual investor, it's not unusual to have a long time horizon. If -- like most people -- you are primarily investing for retirement and you're not planning to retire for 10 years or more, today's stock market gyrations will have little effect on your final selling price. Just consider how the market is up 75% in the last 10 years, despite losing more than half of its value during the Great Recession! 10 Year Stock Market Performance, data by YCharts. Indeed, if you are continuing to add money to your investment fund -- i.e., you are saving for retirement -- you are better off with lower stock prices in the short term. This will allow you to buy at better prices, knowing that over long periods of time, the stock market provides fairly consistent returns. Thus, it is only "disinvestors" -- people who are planning to sell stocks soon -- who lose when the market falls. People who are putting more money into the market than they are taking out should be happy when the market tumbles, because it means stocks are going on sale. Warren Buffett's insight that only "disinvestors" lose when the market falls means that if you tend to worry about your investments, two simple changes could do wonders for your stress level. Warren Buffett argues that investors should like to see stock prices fall. Photo: The Motley Fool. First, you want to be an investor -- not a disinvestor -- for as long as possible. In other words, you shouldn't invest money that you think you'll need within the next few years. As long as you're not planning to sell soon, the day-to-day ups and downs of the market will have no impact on your ultimate investment performance. Second, you need to think like an investor. This can be surprisingly hard, because financial news outlets often cater to Wall Street professionals who are not investors in Buffett's sense of the word -- they are constantly buying and selling stocks. However, by remaining focused on your own goals and strategy, you should be able to adopt a Buffett-like perspective. If you resolve to continue adding to your retirement fund no matter what the market is doing, stock market plunges will seem more like opportunities and less like calamities. Changing your perspective from that of a "disinvestor" to that of a long-term investor can be very hard. The constant blare of headlines about the stock market's every move encourages a short-term mentality. However, as Warren Buffett wisely pointed out more than 15 years ago, true investors ought to be happy when the market is falling. Unless you're close to retirement, you should be putting money into the market in the near-term, not selling. As long as you are a buyer and not a seller, lower prices are better. If you commit to a long-term investing strategy and maintain a long-term investor's perspective, you literally have nothing to worry about when it comes to investing. If you tend to worry about your investments, changing your mind-set in this way could help you sleep a whole lot better at night.